Manager John Sheridan says he is hopeful Plymouth can extend the loan of defender Andy Kellett from Championship side Bolton for a second time. Kellett, 20, initially joined the League Two club for a month in October, before it was turned into a second month in November. 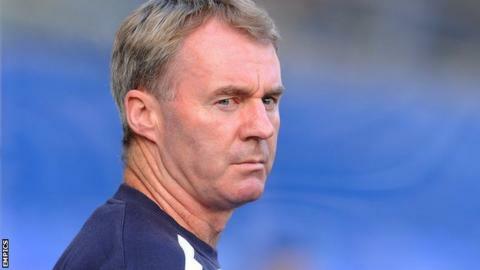 "We've asked him and Andy's happy to stay," Sheridan told BBC Radio Devon. "We're just waiting for Bolton because it's obviously their decision but we're hopeful we can sort something out." Kellett made his debut in the Pilgrims' goalless draw with AFC Wimbledon and has made nine appearances in total. He is due to return to Bolton after Saturday's trip to Northampton. Plymouth travel to Sixfields looking to improve on their away form, which has brought them only two wins so far. They sit sixth in League Two, five points off the automatic promotion places, with Sheridan trying not to get too worried by their form on the road. "It's a concern because I'd like to win games, but everyone else is making a big thing out of it," he said. "I think we've done alright away from home, I just don't think we've got the results we've deserved."